Loss of interest or pleasure in everyday life. Of course, everybody feels some of these feelings some of the time. This doesn’t necessarily indicate depression….this indicates you’re human and you have ups and downs! When we experience difficulties or loss in life it is quite normal to experience a period where we feel the same feelings which characterise depression. These feelings usually pass normally with the healing passage of time. Clinical depression though is characterised by a persistent and deeply pervasive experience of the above difficulties with little or no rational reason to be feeling those feelings. It is true that depression tends to run in families. It is also true that genetic research has failed to identify a single defective gene which might be responsible for creating depression, and researchers believe it is unlikely that one will be found. Other studies have shown that identical twins (sharing the same genes) will more often than not both suffer with depression, which lends weight to the argument that there is a genetic pre-disposition to the disorder. Interestingly though, those twins who were separated at birth and grew up in different environments show less incidence of twin development of depression, arguing that there must be other factors involved, namely of course, the effect of environment on mental and emotional development. It is clear that depression runs in families at least in part because families have “atmospheres”. This is an unscientific plain English way of saying that different families do things their own way, and behavioural traits are passed down from generation to generation. Thinking styles (ways of viewing the world) are also passed down. If the general “atmosphere” of a family is negative and oppressive, it is easy to see how this general “gloominess” is passed on to family members. Michael Yapko makes this case beautifully in his important book “Hand me down blues”. When we think about it clearly, it’s not difficult to make sense of. Did your family possess or provide you with the coping skills you require to make a success of life? If you were not taught how to see the World positively in your formative years then is it any wonder that the World feels negative, hostile, or threatening today? If you were not taught the skills you need to interact healthily with people, how to get your needs met in a functional way, how to have self esteem etc, then is it any wonder that the competitive world we live in feels overwhelming? These are all clearly important factors in determining whether depression will develop or not. So whilst grudgingly I am forced to acknowledge that there is evidence to show that we can be genetically* pre-disposed to depression, I make the point nonetheless that a high proportion of people apparently “pre-disposed” to depressive disorders (over 50% of schizophrenic identical twins sharing the same genes for example!) do not develop difficulties. I say grudgingly* because I believe that our scientific models encompass only biological factors, and these are insufficient as an explanation, but that is another separate article to be written! In any case, let’s conclude that what we do know for sure is that people who grow up in unsupportive or hostile environments are more likely to suffer from mental and emotional disorders later in life. This is clear from the research, as well as by using our own common sense. Let us further conclude that even if we are “pre-disposed” to depression that the evidence bears out that this does not necessarily mean that we DO develop depression, and by extension this tells us that we are not purely victims of genetics! Genetics may be a factor. We might have to work a little harder than someone less pre-disposed than ourselves, but let us be clear, that we can move out of depression, because depression at one level is a response to our environment. If our environment is uninviting, (and this includes our mental and emotional environment), then depression can thrive. Conversely, a positively focused life filled with satisfying activity and success leaves little room for depression. So, having dealt with the genetics …..what does cause depression? This can be summarised with two words: Hopelessness and helplessness. That’s the core of it. Of course there are other peripheral considerations such as diet, lack of exercise, age, medications, addictions, illness and loss etc. It can be a complicated picture for sure, since good health requires many factors to be balanced, but essentially we experience depression when it feels like we can’t be helped, and that there is no hope for the future. At that point something dies inside us (metaphorically speaking) and we stop trying. If you’re reading this and feeling low, you might have been moved by that last line. “Something dies inside”. Sure does feel that way doesn’t it? I’d like to reassure you that you’re still very much alive…..your life (and the self you know yourself to be) is just in hibernation mode. This is what hibernation mode feels like…exhaustion, disinterest, paralysis even. This will make much more sense when you understand what is going on here. Let’s have a quick look at the cause of depression and its purpose. Depression is a physiological response to certain conditions; namely hopelessness. Our ancestors were hunter-gatherers. They gathered their food on a daily basis. They relied heavily on natural crops and game for survival. Without agriculture, and the subsequent storing of surplus food, drought and famine would have been a common occurrence. Nature generally favours survival, and we find ourselves therefore equipped to deal with such emergencies. So, if the rains had failed to fall on a particular year and consequently food had become scarce then the best way to ensure survival is to conserve energy, since when starvation threatens every single calorie saved equals a better chance of long term survival. In a famine, with no immediate chance of food, the situation becomes temporarily “hopeless!” So, what would be the best way to make sure that a human being conserves energy? Feelings of exhaustion, lack of interest, lack of hope, and low motivation will fit that request nicely! Then we are much more likely to turn inwards, become intensely reflective, and cease physical activity. The brain learned that to survive, it was necessary to inhibit energy use in times of crisis (hopelessness). So, we can see then that the feelings depression creates are very “real. The unpleasant feelings of lethargy and disinterest that depressed people experience are in fact powerful shifts in internal chemistry. The brain and body go into an “opt out” mode of existence, which quite literally “grounds” a person. It sends us into an inward looking trance like state of external disinterest and exhaustion. This is what depression is. A physiological response designed to save lives when conditions become temporarily “hopeless”. It can be a relief to sufferers of depression to learn that these feeling are a response and are not indicative of their core being. Our culture favours the view that we are helpless victims of depression; that if we are depressed, then we are fundamentally medically broken. We are told our brain chemistry is faulty. This view, perhaps more than anything else, is likely to keep you depressed! This view assumes that you have no say in whether you are depressed or not, and it gives permission to remain in victim mode, which is the same as saying “helpless”. This needs to be challenged! You are NOT your depression. You are NOT a “depressive”. It is very important to remember this fact. You are a human being suffering an inappropriate physiological response to stress and negative environment. Depression lifts when we change the incoming signal….when we change the environment. There is ALWAYS something you can do to make things better. That is very interesting…. but we’re not in a famine! No famine I agree….but are you starving? I’m not meaning to be clever or dismissive here. This is a serious point. The feelings of hopelessness we might experience in our complex lives today are every bit as fraught with angst and seriousness as those our ancestors will have experienced in the absence of food. The depression response too is every bit as powerful. It didn’t just disappear because we started living in houses and shopping at the supermarket. So follow the logic and you can see that this powerful response pattern can be activated just as powerfully by today’s modern “emergencies” as it has always been by floods, famines or warring tribes. So, what are today’s modern “emergencies”? Well, we have the obvious of course, being immediate emergencies; divorce, bereavement, losing a job etc. These emergencies can trigger depression, but again they don’t necessarily. If we have good coping skills, low stress levels generally, and a strong constitution, we can ride these things out without going into depression. But, there are longer term emergencies too. I used the phrase earlier “are you starving?” It’s long been recognised in solution focused psychology that as individuals, as human beings, we have needs. This is a fact. Though our needs are somewhat subjective, there are certain needs which we all have to some degree; the need for physical safety and security for example. Most (though not all) people have a need for positive human interaction. Other needs include having a purpose in life, being financially secure, employment, peer recognition, friends, interests, to love and be loved. For each individual there will be certain areas which stand out more than others as being critically important to that individual’s sense of okay-ness with the world. If that need is very important and is not being met, and it appears to that individual that there is no way that need will be met any time soon, then this constitutes a crisis or emergency as far as the mind is concerned. To put it simply then, if our needs are not being met then emotionally speaking we are starving. To the mind, the feeling of hopelessness is exactly the same as that feeling our ancestors experienced! So the antidote to this starvation then is to go to find food. Finding food means getting our needs met. The first thing to consider here is whether you have actually stopped looking for it. Human beings at one level, particularly when suffering anxiety and depression operate in a fairly primitive way, much like animals, in that once we have learned that a situation is hopeless we often stop trying. This is called “learned helplessness” and is a well established psychological concept. One well known experiment is that conducted by psychologist Dr. Martin Seligmann. His research programme involved giving dogs a mild but inescapable electric shock. The dogs made the mental connection (learned) that the shock was inescapable. When they were later placed in a cage with two inter-joining compartments, one of which contained shocks, they failed to respond or to try to escape the shocked side, despite the fact that the other side of the cage was shock free. Dogs not subjected to the initial shocks simply jumped to the shock free side. The trained dogs had “learned helplessness” and learned that the only thing one can do with a bad situation is to tolerate it. There have been other experiments showing the same results. It’s an animal trait. We also have an animal brain (the limbic system) and it has more control when we are angry depressed or anxious, so we are operating at that level when in the trance of depression. So, what’s the message here? The drought or famine has passed. There is food outside to be collected, but are you still holed up in the dark cave?! In some weird way depression can become a safe place to be, miserable as it is. I know this makes no logical sense. Why would anyone choose to stay miserable? Often that choice is made unconsciously. Meaning that no-one actually sits down and says “Yes I think I prefer being depressed to living my life!” But, what happens in practice is that depression has become the devil you know. At least it’s predictable. At least you can’t fail any more if you’ve already failed! The mind, being now only familiar with the walls of the cave and having had such a long time to introspect about the terrible dangers lurking outside the cave has become increasingly convinced that the outside world is too dangerous to engage with. Indeed that failure will seem inevitable, and therefore too much to bear. Part of the problem with depression is that it is very convincing. It’s supposed to be. In a famine, it will save your life. It means business, and its job is to STOP YOU ENGAGING with the outside world…to stop you using your energy, and that means that the very thing that you most need when you are depressed is the very thing that the depression is telling you to avoid…connection and integration with the outside world. So the very first thing to recognise is that the feeling that everything is hopeless and that you are helpless, is an illusion. It is not an established fact. It may present as an established fact but if you want to live your life again then it is crucial to recognise that the feelings, however pervasive they may be, are not reflective of the facts. If you’ve been in the cave for a long time, it will have been easy to create a picture of the outside world in your mind which appears to be very threatening. This is part of the cause and the effect of depression. When we are depressed we necessarily see the worst in things, and seeing the worst in things sustains depression. Remember, this is part of the action of depression. It makes life look unappealing and even impossible. That’s what its job is. If we make the mistake of taking that to be an objective truth, especially once the difficulty has passed, then we can see why life looks so difficult! It may well be that your negative experiences in life so far have taught you that certain areas of your life are hopeless, but in truth that is because you have either had a run of bad luck/negative experiences, or that you currently lack the resources to make a success of those areas. If the latter is true, then you can know that resources (knowing HOW to do things) can be learned…no matter how late in life you are! In any case, making the initial determination that it’s worth engaging with life, even if you need to learn new skills to do so effectively, is step one. The important thing to understand here is that you will need to do this even if your feelings are telling you it’s not worth it, or even that it’s too scary, or too much effort. If you feel unable to do it alone then get help. Depression might tell you that you really shouldn’t bother anyone with your problems…this is more illusion…more negativity…more “I can’t be helped”. To overcome these blocks we need courage, and determination. Remember that courage is not the absence of fear but the decision that something else is more important than the fear…in this case …your life!” In my article “When the gloves come off”, I mention that depression is fighting talk. Remember…depression is a bully. Deciding you are going to overcome your depression whatever it takes is a pivotal moment. I believe that when you do this, you’ve as good as won the fight. It might take time, but that’s the spirit that makes stuff happen! The Science of Depression- So now you have decided to create wellness, how are you going to do it? Well, before we get to the practical in this regard it’s useful to know a bit about the science of depression. To understand this we’ll borrow the brain from our “science of anxiety” article, which gives detailed information on the brains’ actions. The principles are the same whether we are talking about anxiety or depression. 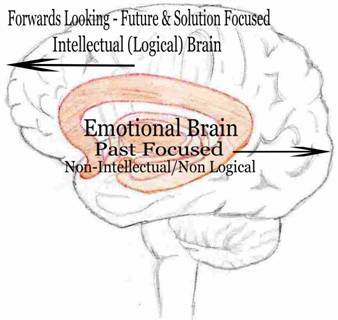 The problem is due to continued over-arousal of the emotional brain (this is the pink area in our diagram). What causes over-arousal? Well, basically, in a nutshell, negative perspectives. This should make sense. Since we know that the emotional brains' job is to protect us, it follows logically that it is always therefore on the look out for potential threats. When we are healthy, the mind has a healthy balance. Most of what we notice and do is positively focused. Some aspects of our life may not be, but the mind can cope with a bit of negativity. Life’s not perfect perhaps, but it’s certainly okay. When we are depressed however, we become increasingly negatively focused, too much so in fact, and we begin to notice (only) the worst in things….a lot! The worse things look generally, the more aroused the emotional brain becomes, because continually perceiving that things look terrible sends a message to that brain that some form of evasive action is or will be required. The emotional brain of course, doing its job perfectly will gladly oblige with one or a mixture of the three main action responses…..anger, anxiety, or depression. The emotional brain is a primitive mind. It is not logic based. It is an INSTINCTIVE and EMOTIONAL mind. The emotional mind, primitive as it is, does not perceive a great deal of difference between what is past, present future, real, or imagined. In other words, to the emotional mind, it’s all the same. It doesn’t matter whether it happened yesterday, today or tomorrow, it is still emotionally arousing. It also doesn’t matter to the emotional mind whether it is really happening or if we are only imagining that it is happening. It is still emotionally arousing. This is crucially important to understand. 99% of what we imagine/worry might happen never does. The emotional mind doesn’t know that though. It takes everything as probable or fact. Depressed people introspect a lot. In plain English this means they think too much. Specifically, they think about themselves and about their lives. Their focus is mainly inward looking, and it is mainly negative and repetitive. What this means is that fifteen of the sixteen hours in a depressed persons day is spent thinking intensely about how terrible everything is, how there is no way out, how bad the past has been, how hopeless and helpless they are, and how the future will be no different. This is referred to then as “negative introspection”. So even though a depressed person appears to be “doing” very little, at the mental and emotional level there is in fact masses of activity, and mostly it is all miserable. It is exhausting for sure. But, as well as being exhausting it is also extremely damaging, because the emotional mind witnesses every bit of that negative introspection, and if you follow the understanding explained above, the emotional mind becomes highly aroused by what it is witnessing, even though it is not ACTUALLY happening. Since it perceives little difference between what is past, present, future, real, or imagined, the emotional mind perceives these introspections as essentially real. The emotional mind concludes that the negative introspections, as pervasive as they are, must indicate how things really are, and it then of course steps in with a response to remedy the situation. So depression is the response which says “If things are THAT bad, then we need to just opt out…it’s safer to not engage at all”, and there you are duly supplied with feelings of lethargy, lack of interest and so on. 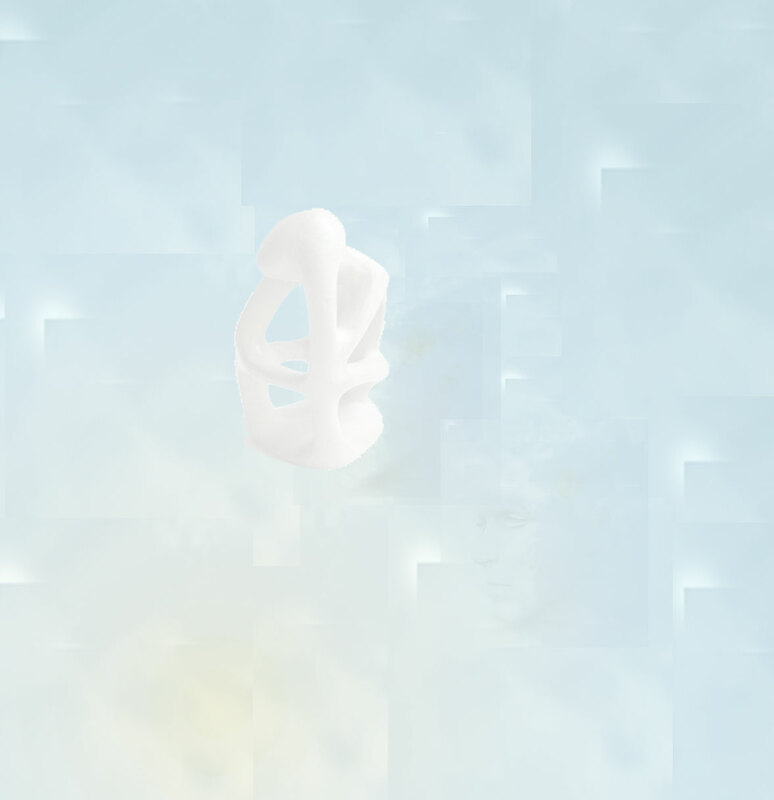 This leads to less interaction with the world as one withdraws and more time to think about one-self and how terrible everything is……and so on it goes! It’s easy to see how this cycle creates depression. There is more to this story too. It has long been noted that people with severe clinical depression will tend to massively over-sleep, sometimes 13 or 14 hours a day. This is extreme, but certainly we note sleep disturbance of one kind or another usually exists alongside depression and anxiety. Joe Griffin and Ivan Tyrell (authors of “Human Givens”) explain this process in their books and monologues, and put forward a modern explanation of depression as a sleep disorder. In the course of an ordinary nights sleep, we cycle between two distinct phases of sleep. In a non anxious person, we will cycle into a period of REM followed by slow wave, followed by REM, followed by slow wave etc, and by the end of the nights sleep approximately 75% of the night would have been spent in slow wave (recuperative, healing relaxing rejuvenating) sleep, whilst 25% would have been spent in REM (highly active) sleep, de-arousing the emotional mind. Studies have shown however that in depression, this balance shifts, and we see much more REM sleep and less slow wave. In fact the whole cycle can invert meaning that we get only 25% restful slow wave sleep, whilst spending 75% of the night wrestling in the realms of the archetype...dreaming....and if we're anxious or depressed, they're probably not good dreams either! Now, when you consider that REM uses more energy than being awake then as far as the brain is concerned, if we sleep 75% REM (as people with severe depression will) and only 25% slow wave, then we have a problem. We are simply not getting the rest (the slow wave sleep) we need, and in fact it’s worse than that; we are actually becoming even more stressed out because we’re working harder at night than we are during the day. Is it any wonder there is a sense of hopelessness?! So what is causing this? Well, basically, again, “negative introspection”. Think about the last time someone really upset you. Think about it. Remember it. Do you now feel a twinge of annoyance/tension in your gut? That’s an emotional arousal. You have just added to your stress level today (sorry…necessary to make the point!). In the “science of anxiety” page, the first diagram shows stress (emotional arousal) containers. Every time you negatively introspect about something that happened or something negative that you are thinking might happen, you can add a scoop to the stress container! If you spend all day doing this, how full is your container by the end of the day? In practice what is happening is that your body is readying itself for a fight because you used your mind to show it a threat. So there is a literal sense of arousal in the nervous system. That arousal does not go away unless it is actually discharged. It sits in your system, leaving you feeling more tense than you were before you had the thought. It might not be noticeable since it was tiny but it is stored nonetheless. There are two ways that the emotional arousal can be discharged from the system; either by taking action (engaging the situation), or through the process of sleep. Since there are many false alarms in life, nature takes care of unnecessary (and therefore un-discharged) emotional arousal through sleep, where it is discharged “virtually” through the process of sleep. When we sleep the mind metaphorically replays the scene of concern (dreaming) and discharges the associated anxiety. So what happens in depression, is that our negatively focused person is spending all day providing scoops of emotional arousal through the process described above. Now the stress container is filled with masses of emotional arousal but there is no action to discharge it (this is one reason exercise is good for helping depression…it burns nervous energy!). Therefore, the only other option is to discharge it through the sleep process. Dutifully, the REM process starts working overtime to de-arouse all the extra emotional arousal that has been created. Of course it is exhausting since the brain has now not only had to deal with a day filled with negativity, but is also now having to work overtime to discharge that negativity through the dreaming process. So our depressed person oversleeps to compensate. It is however fruitless because what happens is that the REM function is being over-used and is exhausting the brain. So even having slept 12 or 14 hours, our depressed person is still waking up completely exhausted. Sometimes, it will go the other way and our sleep will be broken or we will suffer with insomnia. This is more often an anxiety response, but essentially here, the brain is waking us up to save REM. Since REM is also used as an “alerting mechanism” during the day, the brain will sometimes opt to try to conserve sleep rather than over use it based on the assumption that sleep is so exhausting it’s better to be awake, and life is so dangerous through the daytime that we better save some alerting mechanism to deal with the next big threat. Both are strategies caused by over arousal of the emotional mind and both cause and maintain exhaustion! Mild depression might mean that a person gets 8 hours sleep a night but still wakes up tired. The same process is taking place. The REM function is being over used. So, it’s not all about how many hours one sleeps, it’s also about the quality of that sleep too. So, if you’re following this? The answer? “Negative Introspection” and “Emotional Arousal” must be reduced! Then the whole process can reverse. By ceasing continued negative introspection and creating positive perspectives, you stop adding scoops of unnecessary arousal to the stress container and you can give your REM mechanism a chance to get on top of things. Essentially, your REM function can take care of the stress in your stress container when you stop filling it up with unnecessary stress! Then you start waking up with more energy, more zest, more hope, and more positive focus. This may be easier said than done I know, but we have to start somewhere, and just understanding the science of this mechanism should give you a powerful tool in understanding why it’s worth doing and exactly what you need to do in order to help yourself. It takes discipline to do this, but again, when you put your mental health and well-being first it’s got to be worth the effort! Brain Chemistry - Cause or Effect? We looked at genetics earlier as one of the possible causes of anxiety and depression. Faulty brain chemistry is often cited as a cause of depression and is therefore obviously also an important area to understand. Here again, it seems we have a similar picture to the one we find when considering genetics. Some people may have brain chemistry which is pre-disposed towards depression. We have to concede the point that physiology varies from person to person, and in the same way that some people are blessed with very strong constitutions physically, then the same will also be true with regards to mental, emotional, and chemical constitution. Persons with poor physical constitution will need to eat well and exercise regularly to stay well, but they can lead a good life still. We also have to make some distinction with regards to the type of depression experienced. Most depressions are what we might call an "ordinary" (non-medical term!) depression. Anyone can experience ordinary depression, and it usually follows a roughly predictable (albeit unpleasant) pattern. An ordinary depression can come and go. Often, but not always there is a trigger. Then we have Bi-Polar disorder (formerly known as Manic Depression). Bi-polar is really a lifelong medical condition with no known cure (though it is manageable and sufferers can lead satisfying lives once they have the right support). This condition is characterised by severe emotional swings between extreme lows, and manic highs. During the "mania" phase, a sufferer can become dangerously carefree and will often behave in a manner which they later regret. Clearly there are other depressive disorders which need different handling. These disorders occur much less frequently than common depression. For the purposes of this work here today, please assume that we are discussing the brain chemistry issues noted in "ordinary" depression. So research indicates that Serotonin levels in depressed people are generally low. Serotonin is a chemical neuro-transmitter within the brain, which is responsible for carrying signals between one brain cell (neuron) and another. We have approximately three trillion brain cells firing signals from one to the other at any given time. The brains computing power is vast indeed! There are many different neuro-transmitters active in a brain but Serotonin is believed to be the most prevalent and also the most important in regulating our overall level of well-being. So Serotonin is often referred to as the "feel-good" neurotransmitter. When Serotonin exists in balanced levels within the brain, then generally we feel good. So, this great scientific discovery appeared to offer a solution to why we "get" depression. It was, we were told, because we were unlucky, and had been cursed with poor brain chemistry...not enough Serotonin. Enter Selective Serotonin Re-uptake Inhibitors (SSRI's). These are substances which inhibit the re-absorption of Serotonin into the brain. You see Serotonin is released and then re-absorbed, and then more Serotonin is manufactured by the brain and released and so on. So by slowing down the rate of re-absorption, it is possible to make the Serotonin go further by having it stay in the brain longer. The net effect of this should be that you feel happier since more Serotonin in play=More feel good factor. SSRI's are the most common types of anti-depressant medication in use today, though there are other types of anti-depressants available too (MAO inhibitors/Tricyclics). Most people have heard of Prozac. Prozac is the brand name for Fluoxetine. This is still in common use today but there are many other different anti-depressant drugs available from your GP which have a similar action to Fluoxetine. Some of these drugs have courted widespread controversy. Seroxat (Paroxetine) for instance has been in the news a lot over recent years because of it's addictive qualities, and difficult side effects such as suicidal thoughts, and uncontrollable aggression. Panorama (BBC investigation team) investigated over a two year period and found that there had clearly been a cover-up along the way. Users were not informed of the risks despite the fact that the pharmaceutical companies were aware of potential problems. Some of these drugs can have strong side effects in some users but your GP should work with you to find one that you tolerate well and is effective for you. I have met many clients who are using anti-depressants successfully. Many people do not suffer difficult side effects and for many there is clearly a marked improvement in their overall state of well-being. The picture therefore is complicated. I should make clear that I am NOT anti-medication. It is clear that in some cases medication helps. This is for you to decide and for you to discuss with your Doctor. Serotonin we know is necessary to good mental health. It appears that when Serotonin is depleted within the brain that this must be the cause of depression and that depression must therefore be a chemical problem to be rectified at the chemical level. All reasonable enough....except for one missing fact. Serotonin is a mood regulator, but it is also regulated by mood.The production of serotonin in the brain is increased and stimulated by positive living. Every positive thing that happens in your life can lift your mood. Knowing you have something fun to look forward to can lift your mood. Knowing that you will get better soon (or any light at the end of the tunnel) will lift your mood. Deciding you are going to beat your depression (maybe with a baseball bat!) will lift your mood. Getting a sense of humour, going to the theatre, having dinner with friends, making something, helping someone, volunteering perhaps, finding a part time job, studying, teaching. It all lifts mood, and it all stimulates Serotonin production. If you do choose to use anti depressant medication as part of your recovery programme it is sensible to ensure that you deal with the roots of depression in your life. Most doctors will tell you the same. You are not powerless. Yes, you have a fight on your hands. Yes, it will take time. Yes, you have to want it, and yes, depression will argue it's not worth the effort (what's the point?). If you want reminding, the point is life is short and it can be fun. I know that's hard to believe, but it's all subjective. If you want to see life as fun there's no one stopping you. There's no rule book says that's not allowed except the one in your own mind. So dig deep and fight for it. Know that it CAN be done. You can visit the "help" section on this website for practical ideas and inspiration. This website is still under ongoing construction. I have a lot to say and it takes time to get it all down on paper (bytes!). I intend to update this section of the website with a very full description of what you can do. For now however, I'll summarise. I hope the point is clear. Your job is to stop introspecting, to find something inspiring to DO. That means trying new things...being brave...being daring etc. Figure out what you want in life and find ways of working towards making that so. Eat well. Make sure you are enjoying good nutrition. Lay off the recreational drugs/alcohol and cigarettes. None of these help in the long term even if they appear to offer immediate short term relief. If you need help from someone, a friend, a therapist, or a family member, then enlist it. Think ONLY about solutions. Any thought pattern which is not contributing to solution is probably negative. Learn to recognise which thoughts give you a sense of hope and follow those through to conclusion. Use a pen and paper if it helps to remind yourself which thoughts help and which are to be ignored. Then start putting your foot down. Get tough on this point! You can visit my article here on how to self help using CBT. Clean your home. Make it a nice place to be. Buy some flowers. Clear out your drawers. Go for a walk somewhere pretty. Some exercise? Plant some flowers, a herb garden, or a window box. Bring some brightness into your life. Volunteer. Take a course. Learn a language or a new skill. Book a short break. Join a club. Write a blog. Connect! Anything that feels positive will help. Keep at it. You might not see the benefits immediately but the landscape of your life...the backdrop to the depression if you like will begin to look different as you make these changes, and the fact is depression simply cannot thrive in a bright environment. Don't let depression tell you it's not worth it. Do it and then decide if it was worth it. Only someone determined to remain depressed will be able to say it wasn't! Of course it should go without say that you can also contact me if you are in this area for one to one help. I am a trained and certified anxiety disorders specialist with plenty of experience in helping people successfully overcome depression and anxiety. If you would like to meet me to discuss your difficulty and a way forwards please do feel free to make an appointment for a consultation.